antibiotics, autopsy, material, blood, body fluids, cells, chemicals, chemistry, materials, conditioning cultures, DNA/RNA, drugs, electronics, environmental samples, enzymes, epoxy, fungi, glycerin stocks, insect artifacts, plant samples, plasma proteins, reagents, serum, tissues, urine, vaccines, virus, and yeast. • Factory preset at -80°C. • Temperature adjustable in .1°C increments. • Temperature display to .1°C increments. 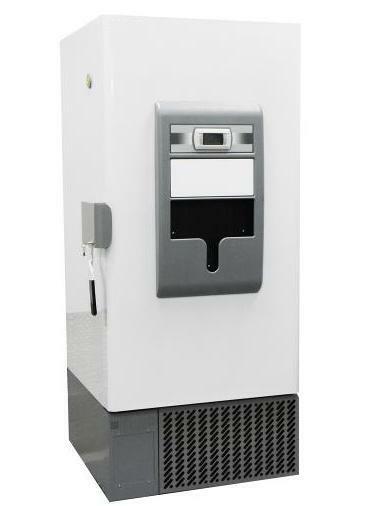 • Control probe located on rear wall bottom left corner for optimal and accurate temperature measurement and control. • Automatic voltage fluctuation compensation, low voltage boost/ high voltage buck. • Incoming voltage monitoring and digital display with built-in surge suppressor with indicator, power failure alarm (audible and visual). • Ambient temperature alarm & indicator indicate room temperature conditions. ﻿﻿• Easy open integrated outer door latch and handle allows one handed opening and closing. 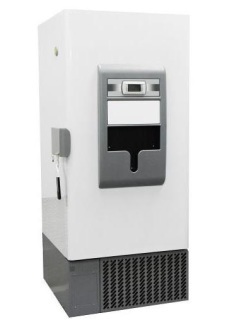 Door latch and handle and are key lockable for added security and protected access to freezer contents. 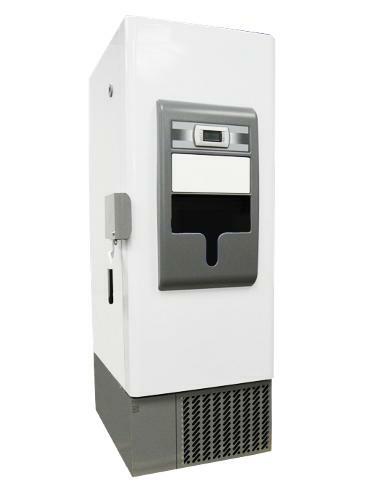 2 keys provided, padlock compatible, low profile cabinet height. • Condenser/compressor protection monitors performance and automatically adjusts to internal and external conditions. • Three adjustable heavy duty door hinges ensure fit and positive seal. 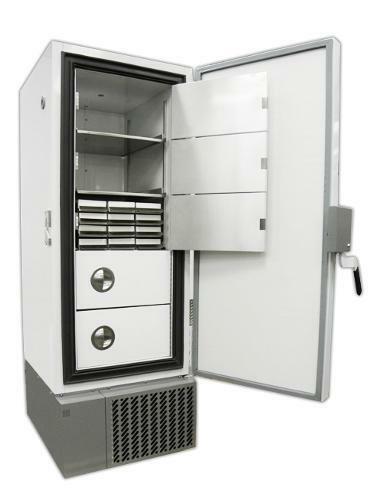 • Exclusive vacuum relief system allows convenient and fast re-entry to cabinet upon outer door closing. Door activated electro-magnetic switch for use with door ajar, optional CO2/LN2 backup systems and vacuum relief system. 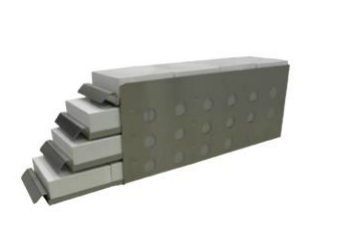 • Sensor access ports (2) 1” diameter is located in top and bottom back wall of cabinet for use with sensor probes. • Heavy duty swivel locking casters (4) and two adjustable leveling feet allow for easy mobility of freezer and stability upon final placement of freezer. • Low profile external cabinet height for easy movement thru hallways, doorways and elevators. • Insulated outer door painted white with 180 degree door swing is right hand opening only. • Exclusive voltage system ensures proper operating voltage to operating system, which reduces incoming line voltage if too high and boosts line voltage if too low. • Clean filter alarm & indicator with event logging alarm history, door ajar indicator (audible and visual). • Remote alarm contacts located on back of cabinet for easy installation and access. • Solid state relay and circuit breaker. • Holds 20 inventory racks- 4 racks per shelf storage. 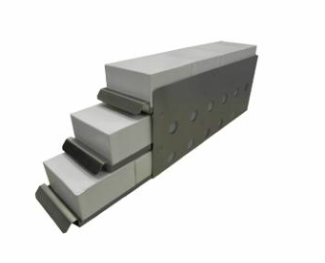 • Packaging/crating/ramp for easy installation. • User operator manual included. 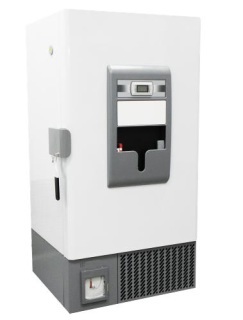 *Ultra Cold upright units load limit for individual shelves is 120 lbs. Warranties: 18 month parts and labor. 5 year compressor (US and Canada) 18 months parts. (International). ***Important note: Always connect the freezer to a dedicated (separate) circuit. Each freezer is equipped with a service cord and plug designed to connect it to a power outlet which delivers the correct voltage. 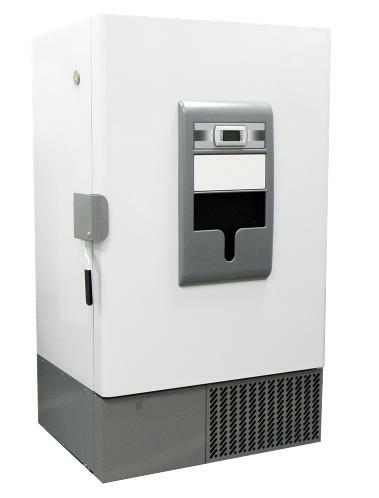 Supply voltage must be within 10%, -5% of the rated freezer voltage on the serial tag. Observe all Warning Labels. Disconnect power supply to eliminate injury from electrical shock or moving parts when servicing equipment. ​A dedicated circuit is required for this product. 230V available at same price, and better suited for shared power circuits. You can request the 230V and provide the 230V Nema Plug Number in the "Note To Seller" box at checkout.